Matt Locke has the enviable (truly!) job of being Head of Innovation for the BBC’s New Media Group. Matt presented an update on his work at Eric von Hippel’s MIT Innovation Lab conference in early September. I had chronicled a couple of these BBC projects in my new book, “Outside Innovation,” so I was pleased to have the opportunity to learn more and to get an update from Matt. With Matt’s help, I was able to turn my stream of consciousness notes into a Q&A format, spotlighting his work in outside innovation at the BBC. This story is well worth a read [download here] no matter what industry you’re in. It’s a great look into work in process as the BBC struggles to reinvent itself in an era of interactive digital media--from the outside in. Take-Aways: Here are some of my take-aways from listening to Matt tell his story. What’s the Value of Customer-Contributed Content? $1.65 Billion! Customer-created content is good business. Letting customers strut their stuff is profitable. Google’s acquisition of YouTube is proof that customer-contributed content is shrewd business practice. Going from zero to $1.65 billion in 24 months is an admirable accomplishment. It’s the kind of accomplishment that makes most business people both jealous and incredulous. Yes, letting customers strut their stuff makes very good business sense, indeed! The content is free. Customers flock to the site to see and be seen. Visitors’ viewing, tagging and downloading habits create a natural merchandising engine. It’s cool because others thought it was cool. I can find it easily because others have tagged it. Customers are playing the roles of Lead Customers/Users, Contributors, Guides, and Promoters. Customer-led merchandising is great marketing. Letting customers strut your stuff reaps advertising revenues and free publicity. What tickles me is how fast the entertainment companies ran around in front of the customer parade. After years of posturing and hand-wringing about intellectual property protection in the era of file-sharing and easy downloading, all of the major entertainment companies signed up to take part in the spoils. This is “found money” – additional revenues they wouldn’t have gotten. It’s also customer-led merchandising. Customers will vote with their eyeballs and their tagging and rating, highlighting as noteworthy programming that might otherwise lag in the Nielsen ratings. Now, what about all those home videos? Will amateurs also get 50% of the ad revenues for their amazing pet tricks’ videos? The Big Idea: Focus on Customers' Outcomes! Paul Brown's "Off the Shelf" column in this Sunday's New York Times, The Season of the Sage - New York Times, comments on three new business books: John Naisbitt's MindSet!, Stephen Covey's The Speed of Trust, and my Outside Innovation. Of the three, Paul likes Covey's best. Mine least. For example, she argues 'you no longer win by having the smartest engineers and scientists; you win by having the smartest customers.' "
"readers...won't find much new ground broken here if they are hoping to learn how to become even more customer-centric." Of course, he neglects to mention the over 20 case studies in the book! Sometimes what is clear to a guru isn't clear to the rest of us. Unfortunately that is as predictable as fall foliage tours this time of year." Ouch! Of course, I appreciate the ink. And even more so, I appreciate the fact that Paul actually TRIED to understand one of the core prescriptions of the book--focus on your lead customers, work with them to figure out what outcomes they're trying to achieve and either provide them the tools to "do it themselves" -- thereby sharing their innovations with you, and/or work with them to co-design how they'd ideally like to achieve their outcomes--thus unleashing lots of innovative new ideas you'd never come up with on your own. It really boils down to this: Find your most insightful and passionate customers, find out what outcomes they're trying to accomplish and help them do so. 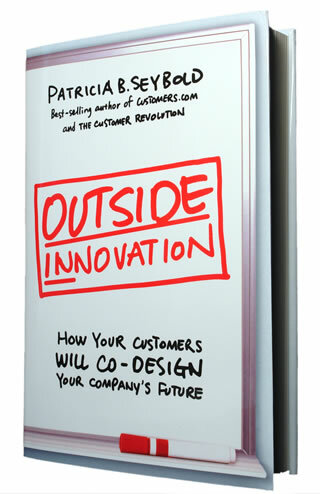 By focusing on customers' outcomes--what they'd ideally like to accomplish--and helping them achieve those outcomes in the easiest, most enjoyable way, your firm becomes an engine of innovation: customer innovation.